My thoughts on different restaurants and dishes that I’ve experienced. I’m not big on going to bars. In fact, what usually gets me to a bar is the food. I’ll usually have a drink, but the food is why I’m there. For that reason, Nick & Jimmy’s has become one of my go-to bars. Nick & Jimmy’s is one of a few restaurants owned by the same restaurateur. These include the Village Inn, Basin Street Grille, and the Temperace, MI Nick & Jimmy’s. Upon entering the restaurant, there is a section of seating and of course the bar. Off to your right is another small seating section and a room with two pool tables and a shuffleboard table. Off of that room is another small bar. There are a few arcade games throughout the bar like pinball. This was my first time at this fairly new Sylvania, OH restaurant. It’s located on Main St. just north of Brint Rd. We had a large party of 12, and were seated at a row of tables in the corner of the bar/lounge area. It was a snug fit, but not uncomfortable. The atmosphere was nice, if not a little dark. We were seated right in front of the fireplace, and it was hot through most of our dinner. I will say now, I grabbed my Canon XSi with Canon 40mm f/2.8 “pancake” to throw in the pocket of my leather jacket, as anything bigger won’t fit. But it was so dark, I couldn’t get any pictures with the lens, I really needed to bring the 50 f/1.4. So I apologize for the lack of pictures. The menu features a wide range of a dishes from the expected Cajun classics like crawfish etouffee, to steak, even Black Angus meatloaf. Every one of the twelve of us found something that sounded good. This seems to be the place I end up when I’m craving some Asian food. This trip, I got to share the experience with my dad after we ran to a couple places close by. At 7:30pm the tables were full, and one just emptied as we walked in. We both looked over the menu, my dad having never been there, and I me not knowing what I wanted to try next. I ordered the Pork Bulgogi, sliced pork pan fried and served with spicy Korean barbeque sauce. It came with a side of white rice, and I ordered a side of Kim Chi. 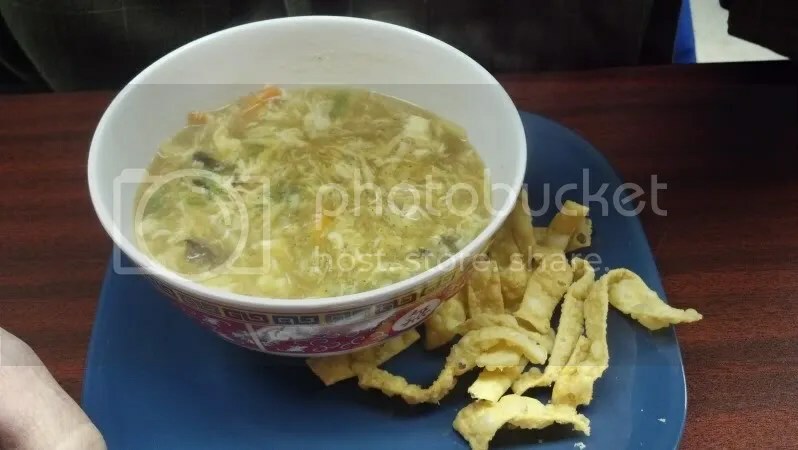 My dad started with a bowl of hot and sour soup and then the Chow San Shen. I’d also like to apologize now for the pictures. I can’t take my DSLR with me all the time; these were the best I could get with my Razr, even with its better than average cellphone camera. Like I’ve said in my blog before, I’ve never been a big fan of the super sweet, heavy sauces that most Chinese restaurants sell. So soup is usually one of my go to items. This is hands down the best hot and sour soup I have ever had. It was served piping hot with some fried wontons Besides the fantastic flavor, it was full of ingredients, not loaded with tofu as a filler like too many others I’ve had. It consisted of bamboo, woodear mushrooms, tofu, carrots, and even chicken. The Chow San Shen is shrimp, scallops, chicken and vegetables in their house white sauce. The seafood and chicken was cooked perfectly, the sauce was not heavy and sugary at all. In fact, it was light and very good. 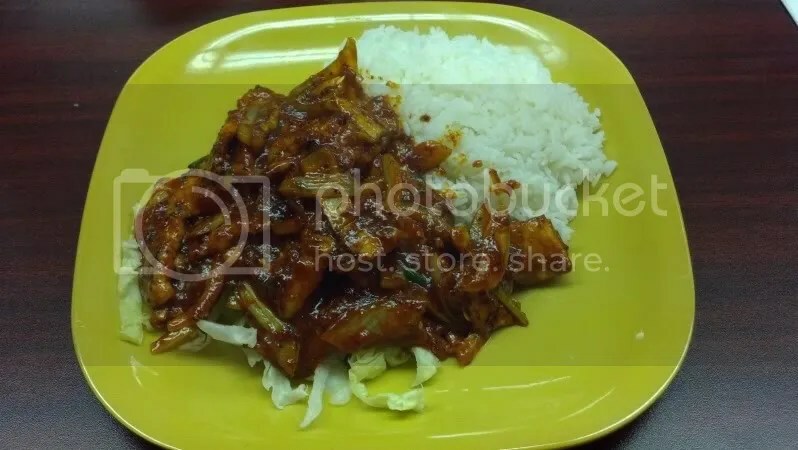 Finally, my Pork Bulgogi: The pork, onions and scallions were covered in a thick dark red Korean barbeque sauce that hit me with a ton of flavor before the heat kicked in. The heat is definitely there, although I don’t personally think it was overwhelming. If you don’t care for spicy foods, stay away from this flavor packed dish. The staff at QQ Kitchen is small, but friendly. You can sit at the bar and watch your food be cooked or just be served at a table. Our waitress was attentive without being annoying, which can sometimes be a problem in such small restaurants. This is obviously not my first time at QQ Kitchen, and it surely won’t be my last. There’s so many things on the menu that sound good, I don’t know how I’ll try them all. But trust me, I eventually will! We’ve been going to J&G Pizza Palace since, well, as long as I can remember. It’s located on Main St. in downtown Sylvania. This is your quintessential hole in the wall restaurant; a dive, in other words. The free standing building is small and old. Parking is limited to a small lot and along Main. St. When you walk in, the small waiting area faces right into the “kitchen” where you can watch them toss pizza dough, pull pizzas in and out of the oven, and slice up generous portions of their gyro meat. You can also watch them make pizza dough and assemble the pizzas through the front window. The seating area is small, with only a hand full of booths and a few long tables. There is usually a wait for a table and people constantly coming and going with carry out orders. Now on to the good stuff: the food! J&G’s pizza is different from any other pizza joint in town. A thin cracker crust is loaded with toppings (our favorite is the house special), then a hefty layer of cheese is laid on. Their pizza definitely makes my top 3 in Toledo. One of their other specialties is gyro. They start with a homemade meat mixture, which is what makes it so great. We often carry out a large gyro appetizer, which is plenty for a couple people, even more if paired with one of their Greek Salads. You can also get a gyro sandwich, served on pita bread with onions, tomatoes, and tzatziki sauce. The sandwich is huge, and it’s very reasonably priced. If you’re in the area, I’d highly recommend you check out J&G Pizza Palace. You won’t regret it, I never do when going there. My dad and I were looking for some place new to go tonight when he mentioned he wanted sushi. 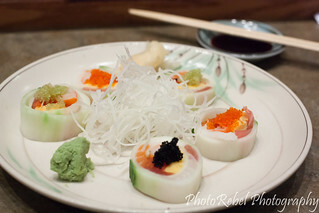 I had heard some good things about Sori Sushi, so we headed over there to give it a try. It’s located on Monroe St. in Toledo, OH. The restaurant is small, but with a nice sized sushi bar. We took a couple seats right in front of the owner and sushi chef, Kenny. We were immediately served by his wife, co-owner and namesake for the restaurant, Sori. She gave my dad and me each a small plate with dish containing cucumbers, a piece of crab, and a gingery dressing. We took a brief look around the menu and filled out our order sheet. I chose a Sori Roll (~$12) as well as an Eel and Avacado hand roll, or Temaki (~$6). I also ordered one piece of sushi, mackerel, since I’ve never had this fish. The Sori Roll is loaded with tuna, white tuna, salmon, snapper, crab, egg, and spicy tuna rolled up in a cucumber katsuramuki (thin sheet). It was served with tobiko in each slice and daikon radish. The presentation was simple, but nice. The roll was very good. I actually took one piece apart to try its ingredients separately. The fish was good, and the egg was sweet. The spicy tuna was not very spicy, but had good flavor. I would definitely order this one again. I’ve been really liking hand rolls lately, and my eel and avocado one had good flavor. It could have been rolled a bit better, but the taste is was counts. And besides, I didn’t lose any of the delicious filling out the bottom; no harm no foul, I guess! 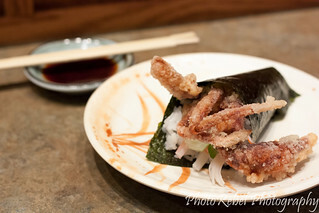 I actually decided to order another hand roll, and I had Kenny make me a soft shell crab one for dessert (~$9). 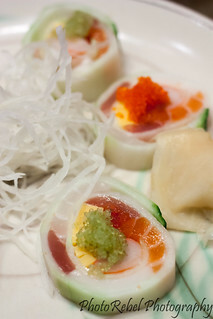 The mackerel sushi ($2) was served with thinly sliced scallions and had a nice seafood flavor. My dad ordered the Spicy Tiger roll (~$11), tempura shrimp with spicy tuna and tobiko on top. I usually prefer a panko breaded shrimp to a real tempura one in rolls, I just think they stand up better. Like I usually find, the tempura was a little soft, but it tasted good. I love the spicy tuna, and the fact that it’s got some texture to it and not just mush. It had only a little heat (how I like my spicy tuna); I’d say it would be fine for even though who don’t like spicy foods. He also ordered a piece of octopus ($2.25) and a piece of eel sushi ($2.75). When I ordered my second temaki, my dad also ordered another roll, the Dancing Eel (~$12). 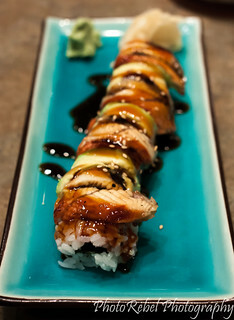 It comes with smoked almost, cucumber and cream cheese inside and is topped with eel and avocado. He doesn’t like cucumber, so he subbed avocado. This roll was my favorite of the night. I could have used a bit less cream cheese, but it didn’t distract from the flavors. The eel went very well with the smoky flavor from the salmon inside the roll. Overall, it was a good time and a good meal. The restaurant is nice inside, and the bar was fairly roomy for the two of us (although there weren’t many people sitting there). The value for what we got was good. The prices seemed about average from what I’ve had in Toledo. Right before we left, Kenny and myself got talking about knives after I spotted the gorgeous yo-gyuto next to his work station. He was friendly and very enthusiastic. Besides, you gotta love knife talk! While not my absolute favorite, Sori Sushi is probably in my top 5 sushi restaurants in Toledo. My family had planned, for my 21st birthday back in November, to drive up to Detroit to go to Greektown Casino and Pegasus Taverna (mainly to go to the latter!). We then got a call from my uncle, who lives in Kingston, New York, and he told us he was coming to visit in December. Pegasus is one of his favorite restaurants, so we pushed our trip back to when he would be here. To keep a long story short, we ate a lot of good food throughout the weekend. And Saturday afternoon, we packed everybody up and drove to the casino. We spent about an hour and a half in the smoky place, which was plenty for all of us. We then walked down the nice brick pathway from the casino past many of the other restaurants and to Pegasus Taverna. This was my first time there. Boy were they packed! Even with a reservation, we waited 20 minutes or so. That didn’t bother any of us, but if it would bother you, I’d suggest not going on a saturday night. We were seated and our waitress took our drink and appetizer orders. One of the main things we came for was Saganaki. 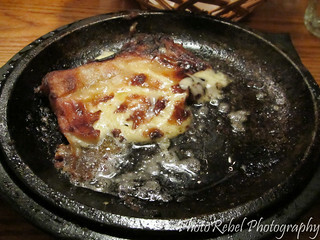 Saganaki is a Greek dish of pan fried cheese. Brandy is poured over the cheese at the table and set alight. Then, of course, everyone yells, “Opa!” The flames are doused with generous squirt of lemon juice and the cheese is eaten with bread. So how was it, you ask? What’s not to love about flaming, brandy soaked, crispy cheese?! Our table of six devoured six before we decided to leave room for dinner. They even polished off half of this one before I could get my camera out. Oh, did I mention the quail? In my quest to discover new and delicious foods, I came across quail on the menu. I took the opportunity to order the little bird, which was boned except for the legs and wings, then baked I assume. Two of them actually. Between the delicious Greek spices and the birds rich taste, I was definitely glad I ordered the quail appetizer. I ate one and everyone else split the other, just to taste it. Then came the main course. Lamb chops are one of their specialties, and I think 3 of the six ordered them. Two at our table ordered sauteed shrimp. I, on the other hand, wasn’t content to just try one thing. I ordered the Pegasus Special. Two lamb chops, 3 shell on broiled shrimp, and a serving of spanakopita, or spinach pie. The lamb chops were outstanding. They were flavorful, meaty, and greasy. Everything a good lamb chop should be. As far as lamb chops go, they were huge. The shrimp, broiled in the shells, took shrimp to a whole new level. In a Greek broth of lemon garlic and butter, they were incredible. 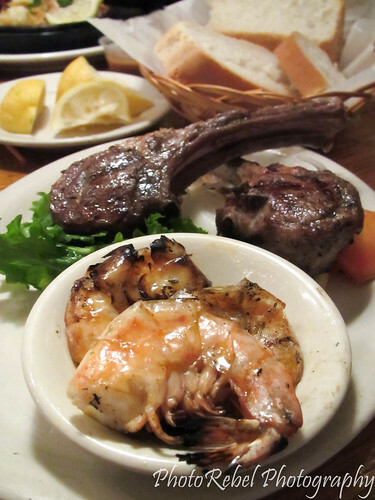 As good as the lamb chops were, I think the broiled shrimp would be my next meal there (on top of a few orders of Saganaki). 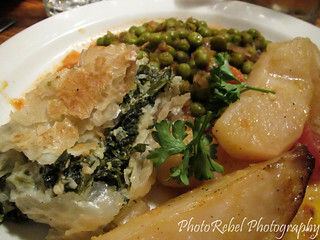 My Spanakopita (shown below) was delicious too! Out waitress was great, she took all six of our orders by memory and got everything right. She was attentive, which was surprising given how busy they were. The atmosphere was good; it was loud but not so loud as to prevent conversation at our table. Our table was a bit cramped for 6 though. It was a great night spent with my family eating good food. Missing the casino wouldn’t have bothered me at all, and next time we go, it will probably be just to Pegasus Taverna. San Marcos Taqueria – Best Mexican Food in Toledo? A friend of mine told me it was the best Mexican food she’s ever had. Doesn’t mean much to me; I’ve been told that about a lot of places only to be disappointed once I eat there. I find the margaritas are usually the determining factor for many. A few weeks later, she mentioned it in class and a couple other people overheard and said it was the best Mexican food they had had too. My interest was piqued, and I did some research online. The general consensus was that is may in fact be the best in Toledo. So myself and three of my friends headed over there after our classes today. We parked in the back, so we could walk through the small grocery store attached to the restaurant. It used to be the other way around (a small restaurant in the back of a grocery store), but it has gained popularity and they’ve expanded the restaurant. 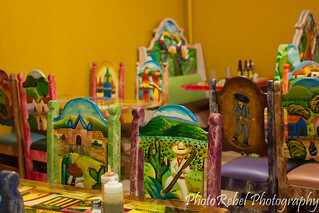 The restaurant is quite vibrant with hand carved and painted chairs and booths. It wasn’t very big, but it wasn’t crowded at all. The menu is simple, and their specialty is of course the tacos. You can a regular taco for $1.50 or a Taco Especial for $2.00 with all the fixings. A cilantro sauce, sour cream, a white cheese, a slice of avocado on top, and more. On the tacos, you can choose between chicken, pork, pork skin, steak, shredded beef, beef tongue, or beef intestine. 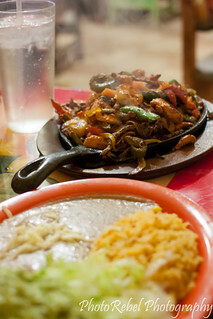 They had a number of other items on the menu including tamales, fajitas, and other Mexican dishes. Upon the recommendation of my friend who suggested the restaurant in the first place, I ordered a Pacifico Clara beer. She is more of a beer drinker than I, although I didn’t think it was too bad. It was served with a lime. I thought it basically tasted like beer, but it was quite smooth with hardly any aftertaste. The clean flavor went well with the fresh ingredients of the tacos. Chips and salsa were served prior to the meal. The salsa was delicious, even though it was fairly mild. The chips were good, but not amazing. Definitely had better and much, much worse. I had three tacos: a pork, a shredded beef (barbacoa), and because I love to try new and unique food, a beef tongue. My tacos are shown to the right, with a couple slices on lime. All were delicious, especially the beef tongue. It tasted like a good beef roast, but even meatier. The texture was very soft, and a bit dry. It wasn’t spongy like some internal organs, but wasn’t quite as fibrous as regular piece of beef. Overall it was good and I will be getting it again. Two of my friend had the special fajitas. They came on a cast iron pan and were steaming hot. Loaded with shrimp, chicken, beef, and vegetables, they looked and smelled great. They were served with a plate full of sides like beans, rice, lettuce, and guacamole. I got a taste of the fajita meat and it had a very good flavor. The friend of mine that suggested San Marcos got a chicken taco and a couple of tamales. She isn’t a big fan of spicy food, and the tamales were on the upper limit for her. I tried a bite and I’d say they were mild. Anything could be spiced up by a couple of bottles of salsa on each table. There was a mild-medium salsa verde that had excellent flavor and a bit of heat. It went well with the lighter, already a spicy pork taco. There was also a hot red salsa that went well with the boldness of the beef tongue taco. The service was good. Our waiter was attentive without being annoying. We were there at an odd time, so it wasn’t real busy, but it was picking up when we left around the start of normal first dinner seating. 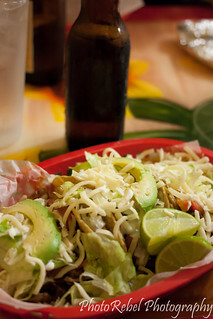 So is it the best Mexican food in Toledo? It might just be. It is definitely the best that I’ve had. If you’re a fan of Mexican and haven’t been to the little taqueria in the back of a grocery store, I’d highly recommend you check it out! It’s well worth the trip downtown. Today, I headed over to a fairly new Asian restaurant in Toledo. It’s called QQ Kitchen, and I’ve heard some very good things about it already. Now this is not the first time I’ve been there, but the first time since the creation of my blog. I haven’t had a chance to eat in the small restaurant in strip mall yet, but I’ve had carry out a couple times. Again, I was short on time and ordered the Jom-Pong to go. 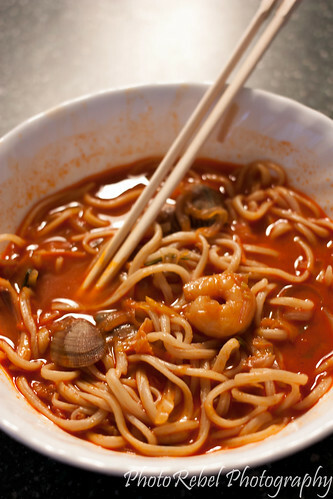 The Jom-Pong is a spicy Korean seafood and noodle dish. I was given a soup container, and to my surprise a regular carry out container. Off I headed to my appointment and curiosity got the best of me; I had to see what was in the carry out. The noodles! What a great idea. In the broth, they’d soak it up and get mushy while turning the broth starchy. Once I arrived home, I eagerly scooped up some noodles into a bowl and poured some of the vibrantly red broth over it. Scooped out some onions and greens along with strips of squid, shrimp, and even some clams. It looked and smelled great, and I couldn’t wait to dig into it. The broth was delicious, the seafood even more so. The noodles were done perfectly, just a little chewy. The heat was there with the spicy broth, but it wasn’t overwhelming. Just to clarify, I do like spicy foods to an extent. I’m not a fan of stuff so spicy it numbs my mouth and I can’t taste anything. This wasn’t like that at all; it had just the right amount of heat and was full of flavor. This is definitely a dish I would (and will) order again, just as soon as I try all the other amazing sounding stuff off their menu. If you ever find yourself around the Westgate area of Toledo, OH go and check out QQ Kitchen, a little restaurant with big flavor.